Most people fear seeing the dentist, even so far as to call it “a necessary evil.”2 To me, this represents a negative feeling surrounding the industry. Movies and TV shows aren’t kind, either. The consensus is that nobody really likes going to the dentist, and most people, me included, feel that pang of anxiety when we have no choice. Going to the dentist is immediately associated with pain and a direct hit to the pocketbook. But there is more to it than even that. Research suggests “Canadians who completely agree they trust their dentist is 9%.” Now this research was taken from a 2012 video presented by CBC called “Money Where Your Mouth is,” so maybe that number has fluctuated, but that number isn’t just low, it’s devastating. How is it that the dental industry, a health care industry, is seen in such a negative light? Well, the same research suggests that “Canadians who agree dentists are business people is 63%.” And let’s face it, if you’re considered a business person first, where does that leave you as a health professional? Patients like me understand that dental clinics are also businesses; but there is a problem if patients see that headline first. My visit to the doctor’s office feels different than my visit to the dentist. Why? Because the first thing that comes to my mind is the business aspect. I have to spend money. Even the way that some clinics advertise tends to take away from the health care aspect. 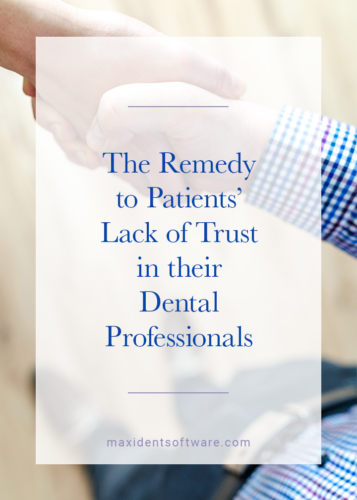 Changing this perception requires gaining the trust that’s so obviously lacking in the dental industry and making sure that your patients are coming in with the expectation that it’s not about the money but taking care of their oral health needs. This is why patient education is so essential to a dental practice, because patient education requires honesty, openness and one-to-one conversations that are the building blocks to gaining trust. Educating your patients also lets them know that you put their health needs well above your business needs. What is patient education, anyway? Patient education is putting patients first and involving them in decisions made about their own oral health. A new process made to the thinking process about health care “involves the patient as a collaborator and partner of care, sharing responsibilities with the clinician.”3 As a patient, it is unnerving to sit in the dentist’s chair with no earthly clue what the doctor is seeing or what they are planning to do about it. In educating your patients, you let them in on the diagnosis as well as the treatment. In one review found on Yelp, a patient praises the doctor for allowing them to see the X-rays that had been taken with the intraoral camera. In her review, she insisted that she really liked that she could see the failing filling and that the treatment could then be mutually agreed upon. In another review, one patient compliments the hygienist on not just doing their job immaculately but for going above and beyond to teach best practice tips. Patient education ecompasses everything you and your team tell your patient, the kind of questions they ask, and how thoroughly you answer. Encouraging your patients to ask questions is a big part of that. So if you’re asked, “What is the difference between necessary procedures and cosmetic or optional procedures?”2 Are you prepared to answer that question honestly? Is your team prepared? It is imperative to make sure that everyone in the office is prepared for questions just like this one. When should you start educating your patients? Start right away. As soon as your patient walks through the door, it is essential that someone is there to answer any questions they may have immediately. Nobody likes to be left in the dark, so this is the first step to establishing a relationship and gaining their trust. If you have a website, go a step further and provide potential patients with information they can take with them. The earlier they understand how devoted you are to their oral health needs, the better for your practice. What are the benefits of providing patient education? Patient education benefits every area of your dental office. But most importantly, your patients are given control over their own dental health needs and will feel less reluctant about coming to see you. With patient education as a prominent factor in your office, your patients can also practice prevention techniques at home, reducing the anxiety that comes with waiting and not knowing what to expect on the next visit. Patients will also appreciate the time you take to involve them in the process, thereby allowing them to contribute to any recommended plan of action. The benefits to you are endless. Not only does providing patient education improve communication between you and your patients, it also increases patient trust and satisfaction. The swift decrease of fear and anxiety also increases the opportunity for treatment acceptance, and a guarantee of patient loyalty, which leads to patient retention. Patients who are satisfied, trusting, and loyal are your path to free word-of-mouth marketing and positive online reviews, such as the Yelp reviews mentioned above. Patient education is at the core of changing the negative perception held by most everyone, and when you and your team go above and beyond for your patients, you will not only bring back the trust that was missing, but will let patients see you for what you really are: a health care professional first.